Anyone who has dabbled in digital marketing would know that there are two different kinds of reach, organic reach and paid reach. Both types of reach allow business owners to make it to their intended audience using different advertisements. Organic Reach: is reach achieved through ads or content that does not require payment; a good example of which would be social media posts. Paid reach: includes advertisements that require payment of a certain fee for an entity to push ads across a user base. Organic reach is the reach of choice for business owners working on a budget because of the affordability and the generally positive reception that audiences have on this type of content. The issue with organic reach on Facebook is that its algorithm won’t show content to fans of a business page if the previous content has not gotten engagement (likes, comments, and shares). This can be very frustrating for business owners just getting started on social media, as well as community manager and firms that are taking over for a previous SMM. 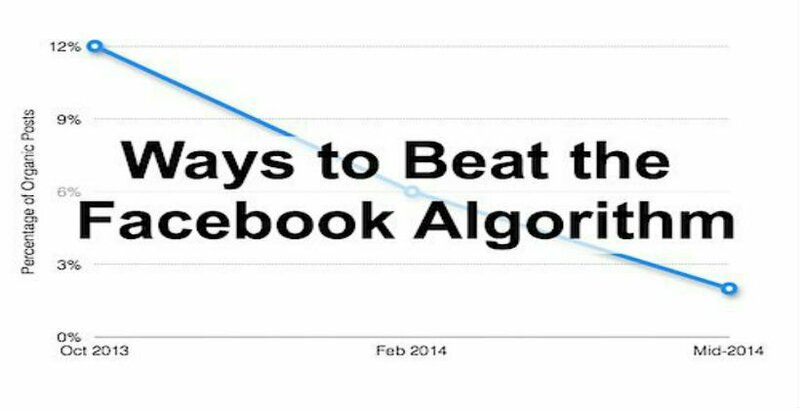 If you want Facebook reach improvement, check out and implement these 8 simple steps. 1. Post Relevant Long-Lasting Content – When you post content, the only way you can ensure that users will interact with it is if it contains relevant and timely content that people will need for more than just a few days. This means whenever you post content on your Facebook page, you should see to it that the information you publish is something people will be interested in long after it’s been posted. This will make it possible for your publication to last for a long time and produce interaction regardless of how old it is. 2. Don’t Overdo It – With so many brands and business fighting for the top spot in the hearts and minds of their consumers, it is expected that there is a significant volume of content being created and published at any given time. That doesn’t mean however that you should bump up your posting frequency to bring your brand to higher ground. Much like any other facet of business, digital marketing works on the principle that quality is always better than quantity. When your posts are able to make better ratings in terms of interactions and user engagement, Facebook is more likely to push you up the ladder knowing that people like what they get from you. If you post a lot and fail to get significant results, don’t expect to get too much publicity. 3. Take Note of the Time – The hour you choose to post your content plays a role in its effectiveness and reach. When you post at off-peak hours, your content is less likely to compete with others on the site, giving your publication a better chance of wiggling its way into people’s feeds. There are lots of ways you can take advantage of the time when it comes to posting content – make sure you understand the hours to get the best results out of your digital marketing efforts. 4. Clean Up Your Following – Check your followers. Are they in your geo-targeted area or are they in other parts of the world? Do your fans match your target demographic. If they don’t…then you need to clean house. Yes, this will take a long time and will drop your numbers, but what’s the point of having a large following if they don’t engage. If they don’t engage, they won’t convert. If they won’t convert, you won’t make money. Just like a store, you’re better off having a few customers who purchase than tons of people who window shop. Start by adding country and age restrictions. This will be the easiest part. Then, go in and remove anyone who does not match your target audience. This may be the most powerful thing you can do to increase your organic reach. 5. Include Personal and Intimate Content – Even if the content you’re sharing isn’t directly related to social media, details of a personal nature about the people in your business behind the scenes can have a huge impact on reach. For example, you could share the activities from a staff lunch or business trip in order to instill a sense of a personal relationship between you and your fans. Also include photos and videos that highlight your team so fans can connect with them. 6. Start a Group – Monitor the comments made by the members of your group and respond to comments and questions without promoting your service or products. But in order for your group to be successful you must invest the time necessary to encourage discussions and greet new members. 7. Target Your Posts – One way to compensate for the decline in organic reach on Facebook is to target your posts to potential customers based on demographics such as location, gender, age, and education. Be sure to enable targeting from your page settings, and choose one or more categories for targeting your post. 8. Use Links and Videos – Native Facebook videos get significantly more organic reach than any other type of post. With the introduction of videos in 2014, the real growth is in videos, and videos are far more effective at reaching audiences. And as surprising as this may sound, some research suggests that links drive more traffic that images. In fact links generate over 80% more page views than posts with photos and links in the caption. 9. Take Advantage of Facebook Live – Facebook’s latest product is getting way more organic reach than any other type of content being shared to Facebook. Facebook live videos are a surefire way to increase your organic reach (at least for now). Facebook Product Manager Vibhi Kant recently announced that the algorithm would favor Facebook live videos when they were live as opposed to once they have already occurred. So keep in mind that this means constant lives will help your brand out. If you have been thinking about taking advantage of social media to grow your business, the odds are very good that you’ve looked seriously into using Facebook to help make that happen. Facebook is the Titan of the social media space, and one of the most frequently visited websites on the planet. Combine that with the wealth of information than the Facebook platform has been able to gather about pretty much anyone and everyone, and you are talking about an advertising and marketing super tool you simply cannot ignore. Without increased Facebook engagement rates on your pages, profiles, or Facebook content, you won’t enjoy all of the significant benefits that this advertising solution brings to the table. That’s where we come in with this quick guide. By taking advantage of the following 7 tips you will dramatically increase engagement on Facebook. It is going to be absolutely impossible for you to create better engagement on Facebook without first creating content that is actually worth engaging with. A lot of people try and throw everything they can at Facebook to see what sticks. Instead, you need to create content that the Facebook community – and your market specifically – is going to be interested in sharing with the rest of the world. Interesting, exciting, and consumable content is the name of the game. Use tools like Buzz Sumo to see what your audience is talking about, play with Buzzfeed type titles, and throw in a few memes to lighten things up. You have to motivate individuals to take the necessary action you want. Think of ways to rally your audience and make them part of something. You could ask you fans to comment on your product in 20 words or less and reward the writer of the best 20 word slogan with a gift. You get the idea. The Facebook Call-to-Action button also allows you to focus attention on a video placed on your website or blog from your Facebook cover image. Abandon corporate speak and transition to the kind of writing and content that really showcases what your brand is all about. Show off your specific personality, engage with your market on a personal level, and leverage everything that Facebook offers to increase your engagement rate. If possible, allow your fans to go behind the scenes of your company with a (video) peek at something they haven’t seen. With every year, more and more customers are choosing social media to reach out to brands because of the perceived immediacy social media brings. More people are also posting comments about brands on their own feeds. In one survey, 53% of Twitter users expect to hear back from brands within an hour of tweeting, and 72% when the tweet involves a specific complaint. Customers now expect quick customer service on all social media platforms, and when people receive a fast responses, their connection to your company is deepened, making them more likely to make purchases from you in the future. Videos are very successful on Facebook. If you do featured video and regular short videos you will garner lots of views and engagement. Last year, Facebook’s video traffic reached 4 billion daily views, making it YouTube’s first real rival in online video. You can also add playlists on your Video tab so you can manage people’s video experience. On Facebook, featured videos are placed above your About section and appear larger on your Videos tab. Featured videos have to be enabled by Facebook for your account. Go to the Video tab and see the button to Add a Featured Video. Do research and create entertaining and educational content related to your brand that will contribute to, and heighten the awareness of your fan base. Most people enjoy reading about little known facts related to a product they may purchase. An objective fact about a product genre will contribute to a product’s credibility. For example, if you’re selling oranges you could include informative information about the wonderful benefits of Vitamin C.
Determine the demographics associated with who is most likely to purchase your product, and then target your content to that audience. This info will provide you with a basic understanding of who your prospects might be. Once you’ve done that you should structure your Facebook pages accordingly. Consider asking your fans what they like and don’t like about your Facebook account and make adjustments. 2. Scroll to the bottom and click on the link that says “Advertising”. 3. On the top right hand corner click on the icon that reads “Create Ad”. 4. If you do not see Targeting Options, you might need to fill in step #1 which tells you to Design Your Ad. Just fill it in with jargon and then click next to get to the Targeting Area. 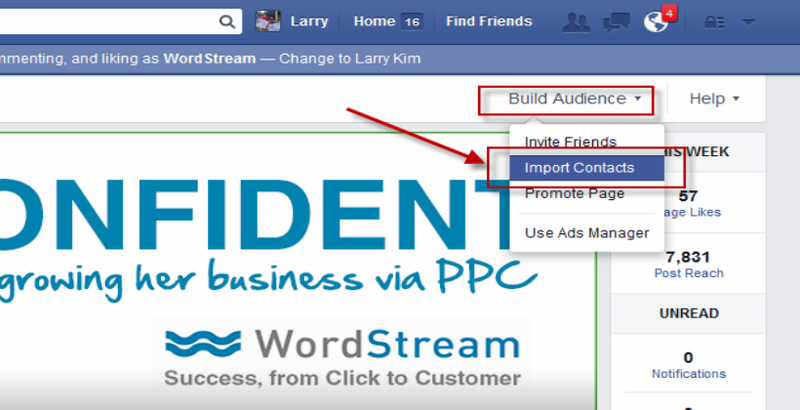 Here you are able to set up your Facebook Ad Campaigns and determine how many users you can target. Which Provides The Best Results on Facebook: Links Versus Photo? With posts on Facebook reaching fewer and fewer users, everyone is striving to find ways to expand their reach. Posting photos is one way to drive engagement on Facebook pages. And some marketers believe using multiple images in a Facebook post may increase Reach even further. However, according to Buffer’s Kevan Lee, when sharing content on Facebook, the best results will come from links. Link posts that use the built-in Facebook link format receive twice as many clicks compared to links typed into a photo update. And Lee adds that this information is derived from Facebook itself, which conducted studies on the number of clicks for different post types. Their findings suggest that link format outguns photos, and when sharing content on Facebook, the best results come from links. So what does a link post look like compared to a photo post? And how can you publish one and not the other? Link posts take advantage of meta tags from the webpage, including information on the page’s title, description, and photos. When you paste a link into the update box on your Facebook page, Facebook will pull this information in automatically and place it in a link format. Photo posts require uploading and attaching a photo to your update, along with the custom text you choose to add. You can include a link in the custom text and these are the links that fail to get the better click rate compared to link posts. Lee points out that when you’re writing a new update, you won’t see an icon to enter a link. The options up top are for Status, Photo/Video, and Offer/Event. To share a link, copy and paste a URL into the composer window, and Facebook will display the link’s meta information—title, description, and photo. With the link that you share, you can control the text and image by editing the open graph tags on your page. Lee has written here about how this whole process works, and if you want to check your progress before publishing an update, you can plug in your URL into the Facebook Open Graph Debugger tool to get a preview (and check to see what might need fixing). 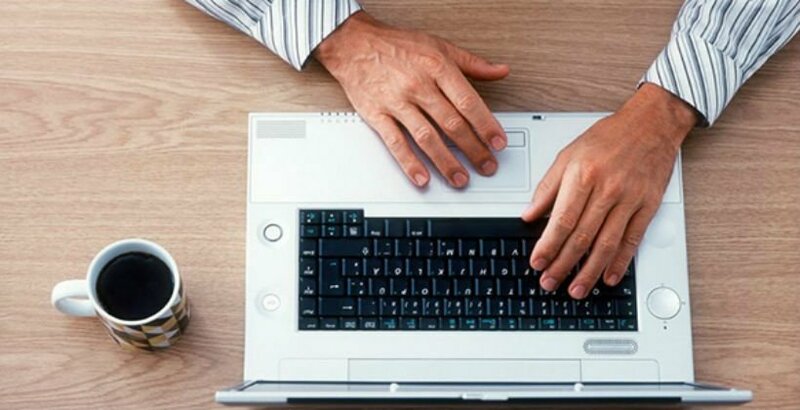 Lee provides 4 more posting tips he characterizes as establishing the perfect Facebook post. 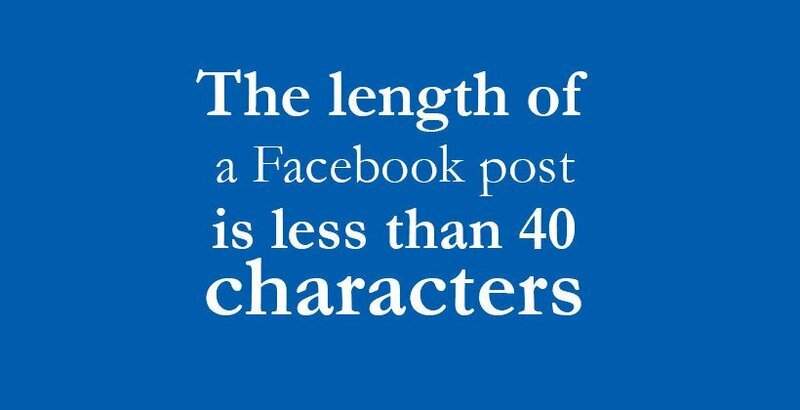 Posts at this length tend to receive a higher like rate and comment rate—in other words, more engagement. A Buddy Media study of 100 top on Facebook found that 40 characters or fewer receives the most engagement on average (it also happens that these ultra-short posts are the least frequent types of posts on Facebook). Other studies have confirmed the “shorter is better” maxim. 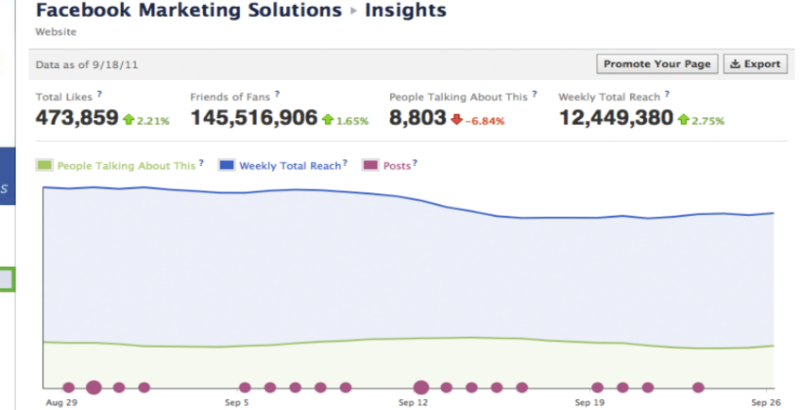 BlitzLocal studied 11,000 Facebook pages and found that engagement increased as posts got shorter. 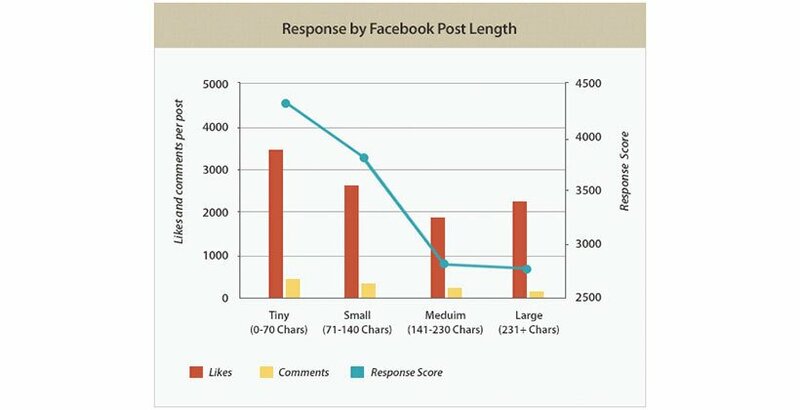 Track Social noticed the same effect in its study: So-called “tiny” posts of zero to 70 characters saw the most likes, comments, and responses. And keep in mind that you’ll also get to use the link’s title and description text to entice readers to click, comment, and engage. The 40-character intro is more of a teaser, supplemented by the text in the link itself. The thought process goes like this: You compete with hundreds of thousands of posts to be seen in the News Feeds of your fans. If you post your updates when few others are posting, your updates stand a better chance of making it through. We’ve referred to this “Late Night Infomercial Effect” before. And Track Maven found some data to back it up. 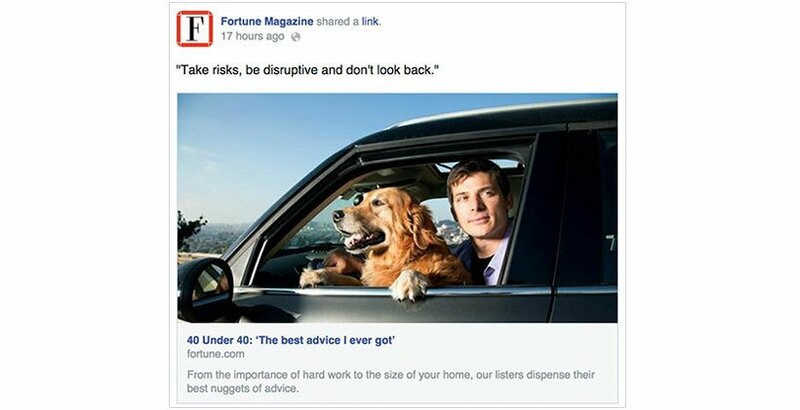 In their study of 5,800 pages and over 1.5 million posts, Track Maven came up with best practices and advice for brands. Among the tips, post on Saturdays and Sundays and post after regular work hours. In order to land a spot on a user’s Facebook News Feed, try shifting your scheduling strategy from posting during the most popular times in the workweek to the most effective times. The best window for a workday is 5:00 p.m. to 1:00 a.m. Eastern Time. For another bump in engagement, try posting on the weekend. Mark Schaefer and Tom Webster analyzed data on 8,000 Facebook pages (data courtesy of AgoraPulse) to identify how brands were impacted by the apparent drop in organic reach. They came away with some intriguing stats (more than 70 percent of pages had a 30 percent or more decline in organic reach) and some best practices from the handful of pages that are succeeding. * They get a LOT of shares (thanks to the 3 points above), and shares are what offers the highest level of “viral” visibility for a page’s content. Let’s assume you have an audience that is passionate about your page (which is why they became fans, right?). Let’s also assume that you are publishing good content. What’s the key third ingredient? Consistency. The successful pages in this study posted at least once a day, creating an expectation among its fans of consistent, quality content. There are several ways of staying on schedule with your Facebook posts; set up a content calendar or sign up for a free scheduler like Buffer. Then start filling your queue with quality content. If there’s ever a way to slip in a newsworthy angle to your Facebook post, do so. Facebook’s latest tweaks to its News Feed algorithm give a slight boost to timely, trending topics. We’ve heard feedback that there are some instances where a post from a friend or a Page you are connected to is only interesting at a specific moment, for example when you are both watching the same sports game, or talking about the season premiere of a popular TV show. The first element is related to Facebook’s “trending” section of the site, which identifies topics and conversations that are popular among users. The second element factors in the rate at which users are liking or commenting on a post. Facebook currently looks at total number of likes and comments as a factor in whether or not to display a post in the News Feed. With this latest update, another consideration will be when those likes and comments occur. According to WordStream founder Larry Kim, Ogilvy, an international advertising, marketing and public relations agency based in Manhattan, cites anonymous “Facebook sources” as telling community managers they can expect Facebook organic reach to plunge to absolutely nothing in the foreseeable future. Early this year, Ogilvy found Facebook’s organic reach is just 6% for the more than 100 brand pages they evaluated, with large pages over 500,000 followers seeing just a 2% reach. These numbers are rapidly in decline. Content marketer Miranda Miller suggests the bigger your brand, the more you’re being pressured toward paid content. In order to level the proverbial playing field, Larry Kim provides 13 tactics to beat the Facebook algorithm and help you get your fan engagement back. The old adage remains true – (quality) content is king. (Sorry about the cliché, Elisa.) If you post awesome content, your chances of being liked and shared increases, boosting your presence in Facebook news feeds. Many of Facebook’s algorithm tweaks are aimed at weeding out what Facebook deems “low quality content,” like memes. For greater reach, opt instead for quality content from news sites. It’s a bit bourgeois for Facebook to assume CNN articles are always classy and memes are always pond scum, but we don’t get much choice in how Facebook adjusts its algorithm. My suggestion? Ramp up on your own original high-quality content with e-books, blog posts, white papers, etc. With organic reach down, now is the perfect time to experiment with Facebook advertising. 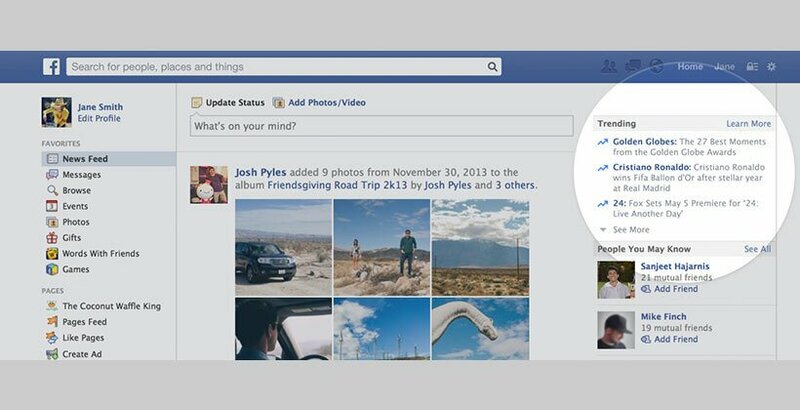 Facebook has revamped their ad system to be easier than ever to use. Paid Facebook ads can appear right in a user’s newsfeed, seamlessly blending with organic posts while boasting better reach. Give them a shot and see how they perform. Integrate your Facebook marketing with other social networks – post pins, tweet, etc. Facebook has become crowded, with organic space steadily shrinking. There’s tons of competition and it’s easy for your content to get buried in users’ news feeds. Explore greener pastures by delving into newer social media hubs like Instagram, Vine, Pinterest, Tumblr, or Google+. Don’t let Facebook be your crutch. Personal account posts tend to show up more in news feeds than business page posts, so why not take advantage of your staff members? Most of them probably use Facebook, so get them liking and sharing your company content. All is fair in the Facebook wars. If you have a big email list, you can import your contacts (up to 5k names at a time) and invite them to join your Facebook page. A higher number of Facebook friends means that your content will reach more people, despite lower organic visibility percentages. The more the merrier. 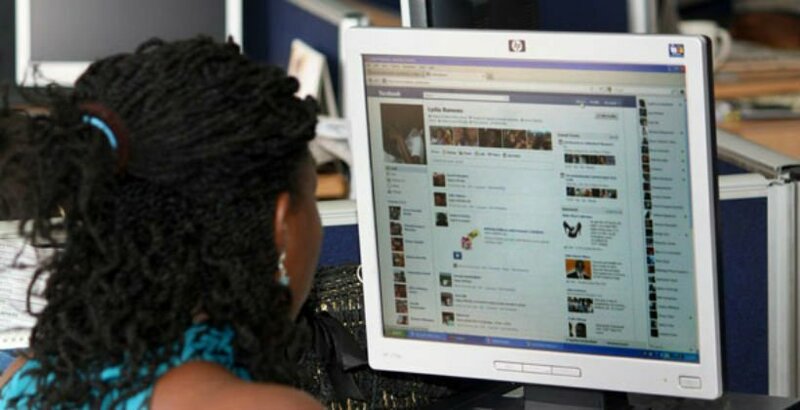 Increase your chances of appearing in news feeds simply by posting more. Get the odds in your favor! Posting 4-6 times a day increases the likelihood that one of those posts will get a bite. Make your Facebook posts count by sharing exclusive content users won’t find anywhere else. Publicize flash sales, special discounts, contests, etc. Since organic Facebook marketing has become significantly more difficult, it’s time to start paying careful attention to your analytics. You don’t need anything too fancy – Facebook’s own analytics can show you which posts perform better than others. See what kind of content drives the most engagement with your followers. Do they respond to videos? Which articles do they click on? What topics get them excited? Look for trends and then replicate for success. Don’t rely solely on text posts. Image and video posts perform exceedingly better than text posts. Share YouTube videos, Pinterest pins, and Instagram pics on Facebook. With Facebook’s buyout of Instagram, it wouldn’t be ridiculous to think that maybe Facebook is giving preference to Instagram pics over other pieces of content. Nothing official on this of course, but it doesn’t hurt to amp up the Insta-posts just in case. If you’re not making much of a splash on Facebook these days, at least make the attention you do get worthwhile. Take advantage of Facebook as a source of user generated content by hosting photo contests, video contests, etc. You may not get as many entries as you would have in Facebook’s glory days, but the user generated content you do get is golden. User generated content can be repurposed and used elsewhere in blog posts, testimonials, and other marketing materials. Drive fan engagement by asking questions and encouraging fan response. Try caption contests, fill in the banks, and other posts that drive user interaction. In return, it’s your job to follow suit by responding to their questions and comments and interacting with fans whenever possible. Make the most of the fans that interact with your Facebook page by using a powerful cover image. 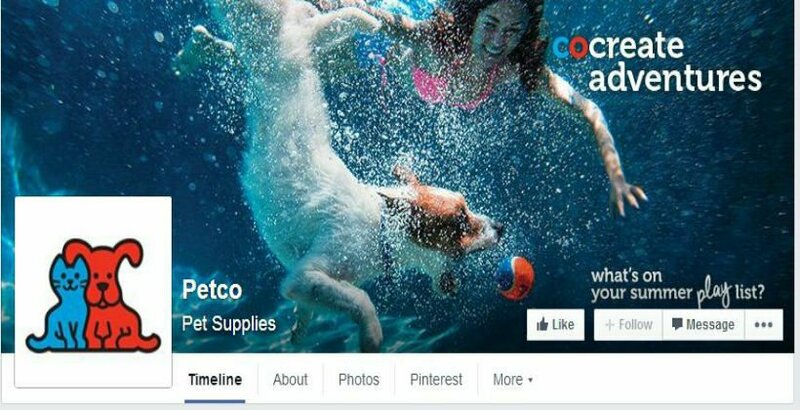 Try using the Facebook cover photo as a call to action. Firstly, a disclaimer – this last workaround might be considered “gray hat,” but it can work very well if handled correctly. To boost exposure for your business pages, reach out to and forge relationships with one or two other community managers in similar industries and agree to like each other’s content. Alternatively, if you’re not comfortable doing that, ask your employees to like one update per week – the increased post engagement will improve post visibility. Don’t post too often, but often enough to make sure your content is fresh and original. The idea is not to overpower your audience, while also making sure they remember you. In other words, find the right balance. Your post can be found under a specific hashtag on Twitter, Instagram, and also on Facebook. Just don’t include more than two hashtags, otherwise your post may appear spammy and decrease your reach. Avoid over zealous attempts at promoting your brand, otherwise your posts will have a smaller reach. Limit your posts to relevant topics, trends, and tips. Create questions that compel your fans to engage. For example, prompt fans to click “like’ if they are stimulated about a post, or have them “Fill-in-the-blank”. Likes and comments increase the Affinity Score between each fan and your page, boosting how many fans see your status updates. The Facebook Algorithm responds to posts that include trending subjects. That’s why it is important to keep current on trending developments, and not schedule your posts too far in advance.